The latest Intel Roadmap has been leaked which reveals that Intel would be skipping the launch of their 14nm Broadwell processors in 2014 and launch an Haswell refresh instead. Images are courtesy of CPU-World! The Tick-Tock model from Intel suggested that Intel would unveil their 14nm core architecture “Broadwell” in 2014 but the new roadmaps are suggesting that Intel would push them forward to 2015 and launch an Haswell based processor refresh in second quarter of 2014. This means that the upcoming 2014 family of processors will bring nothing new except process improvements and faster clock speeds. Maybe we would finally get to see 4 GHz clocked chips since rival AMD has already topped the 5 GHz barrier with their recent FX-9000 series launch. Processors based on the Haswell refresh would still feature the 22nm Tri-Gate architecture improving upon the CPU and GPU clock speeds but this doesn’t mean we won’t see any more fourth generation Haswell parts in 2013. 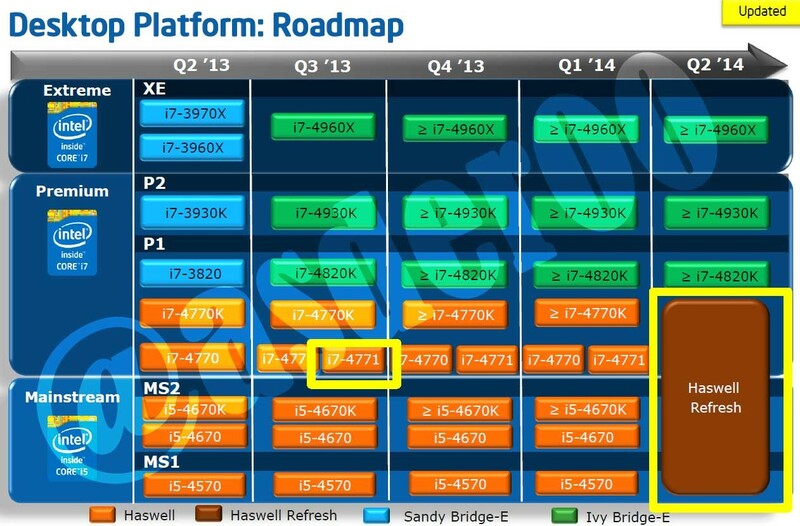 The roadmap also reveals a new Haswell processor called Core i7-4771 which is the successor to the Core i7-4770 (Non-K) CPU and would launch in Q3 2013. Specifications are not known but i expect a 100 MHz clock speed bump which is usually done by Intel. A new chipset Z97, H97 would be introduced for the Haswell refresh platform which would also offer support for LGA 1150 based Broadwell processors in 2015. The new chipset would bring SATA Express support with a native bandwidth of 10-16 GB/s. Moving in 2014, Intel would also release their Haswell-E HEDT platform which would be the first processors to support DDR4 memory and compatibility with the X99 chipset on LGA 2011-LGA 2013 sockets. More can be found here.